ThinkTQ, Inc. is the world’s leading publisher of virtual training products exclusively focused on personal and professional excellence — the only company with the tools, technology, and systems that make it possible to instantly improve your performance — dynamically accelerating your potential for true and lasting success. With over 25 years of experience, we have the resources to do something that others can only promise: Train you to immediately produce greater Results… in less Time… through a continuous process of self-measurement… self-evaluation… and self-improvement. Personal success. Business success. Financial success. Spiritual success. Here you will find the answers you seek — not just an endless discussion about the philosophy of success. TQ is patterned after the US Olympic Training Progression: Master your Fundamentals… Train to Train… Train to Compete… Train to Win. Our mission for 2018 and beyond is to transform the world’s 2.5 Billion Smartphones into a Transparent Learning Engine™ to help people release their full potential — by informing smarter decisions in the moment — immediately leading to better results. Improve your results and you achieve that better life you desire. You earn more money, rise faster in your career, and find the peace of mind that comes from knowing you have done your very best each day. If you do your very best, what more is there? Founded in 1995, ThinkTQ, Inc. is the world’s leading producer of virtual training products exclusively focused on personal and professional excellence. We are a DISRUPTER in the $15 Billion/year US self-help, personal growth and loosely defined brain-training arena. The global market for personal development tools is estimated to exceed $50 Billion. TQ has an INFINITE source of categorized content… deliverable in bite-sized, sequenced, Twitter-esque consumable portions for our A. D. H. D. world… mobile-enabled, and platform/ hardware agnostic. Our MISSION is to make it fast, fun and easy for people learn, remember and master the success-critical skills needed for higher achievement… in an environment as fun and simple as music-streaming. Our GOAL is to turn the world’s 2.5 Billion smartphones into a human neural net that helps people realize their full potential. Our Irresistible Proposition is that we generate more Aha Moments per day than any other App on Earth. Tutorials are fine for transmitting facts… but do little to train the mind to THINK… which is the problem we solve through our revolutionary new Transparent Learning Engine™. The world is in desperate need of ENCOURAGEMENT and TRAINING. The vast majority of the tens of millions of small businesses and their employees have no real access to systematic, measurable and procedural training in the area of personal and professional EXCELLENCE. Where others are investing Billions of dollars in artificial intelligence to get machines to think, The Time Prism is an Idea Generator designed to get people to THINK. Our VISION is to heal this fractured world by releasing each person’s full potential… to transform the world by creating a network of people working at maximum efficiency, effectiveness and producing exceptional results. Our MARKET is the 500 million folks on LinkedIn looking for a career edge… the 125 million small businesses around the world… and every person on the planet who is serious about accelerating their personal growth. Over the years, we have found that people in some form of transition represent our core AUDIENCE: Changing jobs, new hires, retires, downsized, promoted, pink-slipped, divorce, marriage, change in family situation, small business growth/decline, etc. At some point, every person goes through points of TRANSITION where building transferable skills become a priority. We are always there when we are needed: 24x7x365 globally. Our TECHNOLOGY? At our core is 5,000 years of raw knowledge on high achievement, success, excellence, extraordinary personal effectiveness… highly organized, condensed and distilled for maximum impact… transformed into a Transparent Learning Engine™ that is systematically structured, fun, simple and powerful. TQ contains the BEST ideas from the BEST brains who ever lived… from Aristotle to Covey, Blanchard, Robbins, Napoleon Hill, Peters and hundreds of the thought-leaders that shaped our world. So, what is Transparent Learning? It is learning without even knowing you are learning — learning to the point where you don’t need to remember because ideas become intuitively transcendent and penetrate both your conscious and subconscious mind… to SHAPE your thoughts… and prompt you to take smarter actions… in the moment. Our core BELIEF? 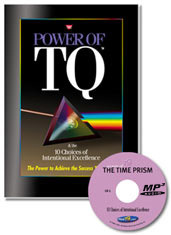 The underlying belief behind every TQ product is that we BECOME what we LEARN. Learn positive new ideas that inform smarter decisions in the moment, you immediately achieve greater results. Do this day in day out, you become the best version of yourself possible. No question, we BECOME what we LEARN. Which is why we created the Time Prism: The World’s Smartest App. Training your mind to THINK is our driving PURPOSE — encouraging, informing and engaging you with a surprise encounter with an idea that you would never think of on your own. Ours is brain training and skill building engineered on the TIMELESS PRINCIPALS of practice and drill, spaced repetition, conditioned/response, habit rendition, and structured sequential memory reinforcement… the same training regime that builds MARINES, Doctors, MBAs, Navy Seals, Olympians and successful business LEADERS. We just make it fun, encouraging and effective… and more importantly… freely available to the billions of people on the planet that have virtually no access to high-quality training. An interesting aside ~ do not confuse us with brain games! The research is in: Brain training computer games do not make you smarter in general. A new study recently published (July 14, 2017) in Psychology Today suggests that commercial brain training computer games have no effect on cognitive function. Researchers at the University of Pennsylvania found that they also have no effect on decision-making. While it might be fun to do puzzles, “exercise” your brain, and otherwise entertain yourself for a while, the independent science simply does not support the gamer’s claims. Yet, people desperately want to improve… to succeed. Since the dawn of time, people have continuously strived to do better… to make their lives better… to fulfill their most basic needs… to become the best that is within them. In 1943, Abraham Maslow created his widely accepted notion of our human hierarchy of needs… beginning with food, shelter and safety… rising to self-confidence and esteem… then ultimately to transcendence. His unifying idea is, “What a man can be, he must be.” This quotation forms the basis of the perceived need for self-actualization. This level of need refers to what a person’s full potential is and the realization of that potential. Maslow describes this level as the desire to accomplish everything that one can, to become the most that one can be. Without question the most basic of all human desires is self-betterment. To become all we are created to be. Which is WHY TQ exists! And we all know that better is a never-ending story of a life well lived… to become better today than yesterday. Better happens when we are consistently exposed to new ideas that engage and encourage us. To make excellence your prevailing attitude. We know that when you inform smarter thoughts and actions in the moment, you are immediately more effective and produce greater results. Most people would call that smart. When you are encouraged to think outside the box… discover new ideas for dealing with daily issues… your performance improves and you are more successful. Pretty much the highlights of TQ in a couple of minutes! Finally, two words: Expect Success!